QUALITY TEXTS are a top priority and our team spent over two years compiling and editing the best references available. In the updated editions, the text is even more clear and each individual character is uniquely identified. 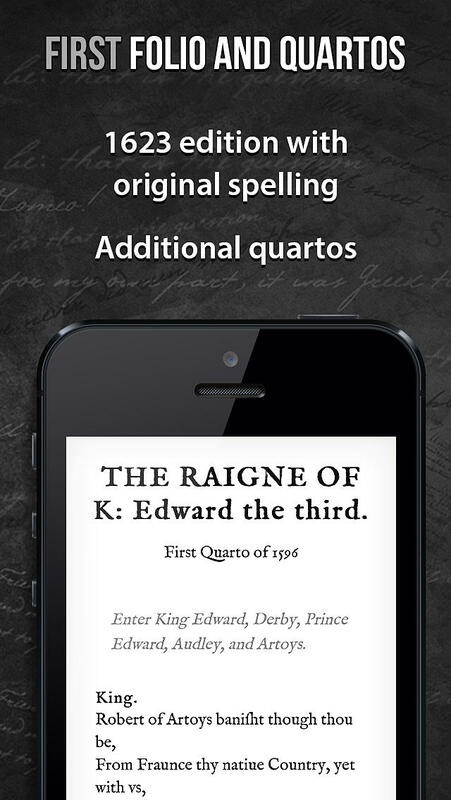 FIRST FOLIOS AND QUARTOS in original spelling show the works as they were originally published in Shakespeare’s time. 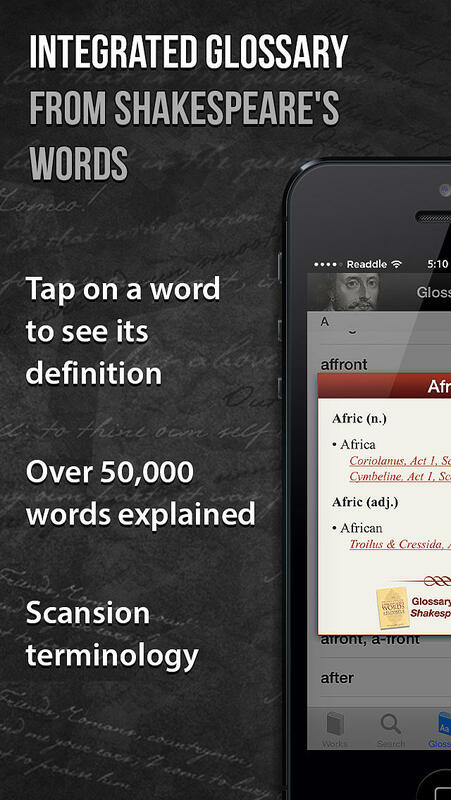 AN INTEGRATED GLOSSARY, based on the bestselling lexicon by David & Ben Crystal, Shakespeare’s Words™ is included. Once this powerful feature is activated, simply tapping on an entry will display its definition in context (not just a general definition). TAKE NOTES AND SHARE THEM with your friends and colleagues. Organize your notes into notebooks for use in the classroom, theatre, or just to remember key facts. 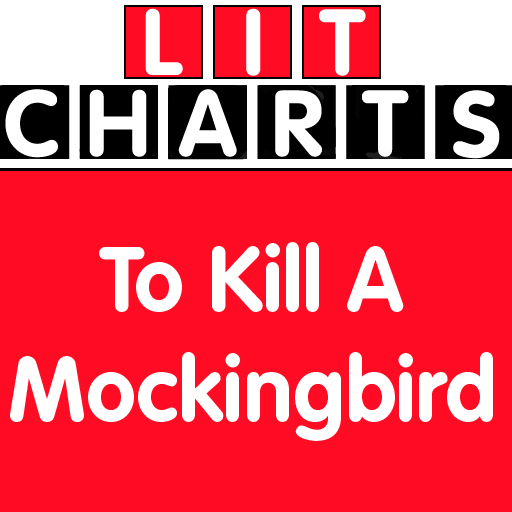 CUSTOMIZE YOUR READING EXPERIENCE by choosing from a variety of color combinations, change the font family and size, display long or short character names, jump around to different scenes, and view line numbers (*read the note below about line numbering). BOOKMARK YOUR FAVORITE PARTS in addition to remembering the last page you viewed. Even copy/paste that great line. SCENE DESCRIPTIONS break down the action in each and every scene throughout the works. CHARACTER DESCRIPTIONS help you better understand the actions and motivations of every character. 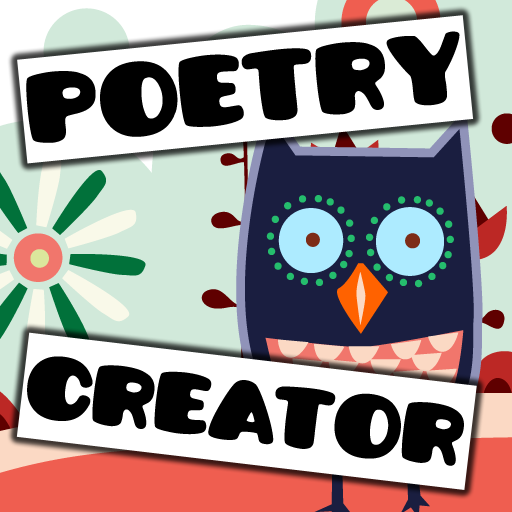 GET THE FACTS by reading up on Shakespeare’s life, view data and chronology about his works, and an overview of scansion terminology. 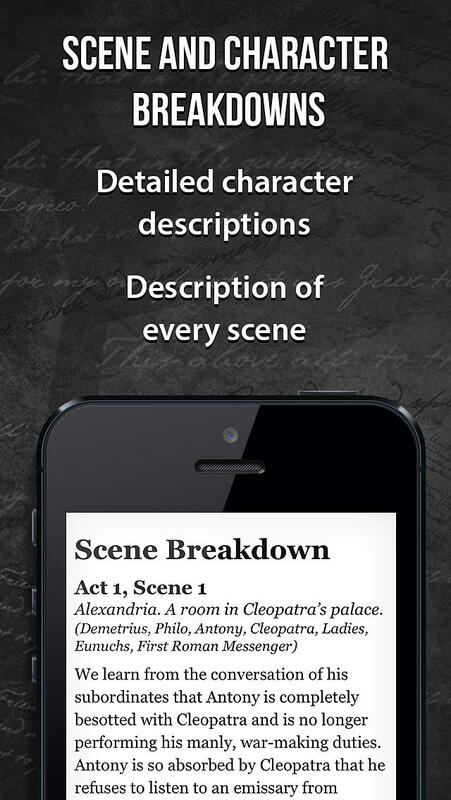 DETAILED SCENE BREAKDOWNS give you an overview of the scenes within each play, their locations, and the characters present in each. 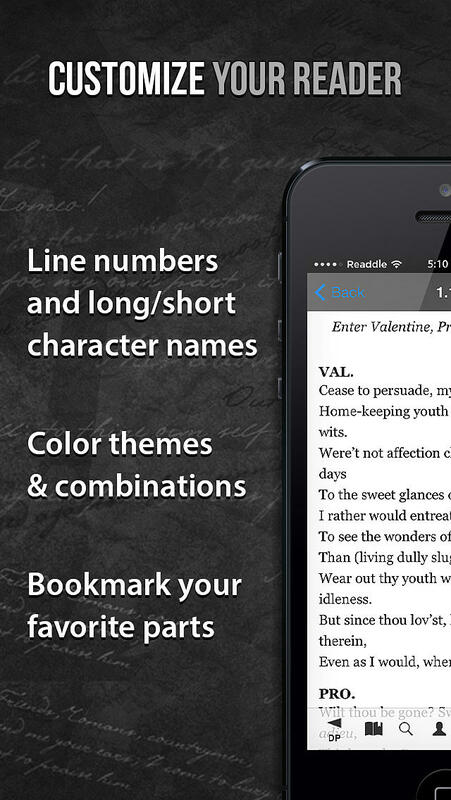 SHAKE YOUR DEVICE for Shakespeare himself to display a random memorable quote. BROWSE THE GALLERY of famous Shakespeare portraits. 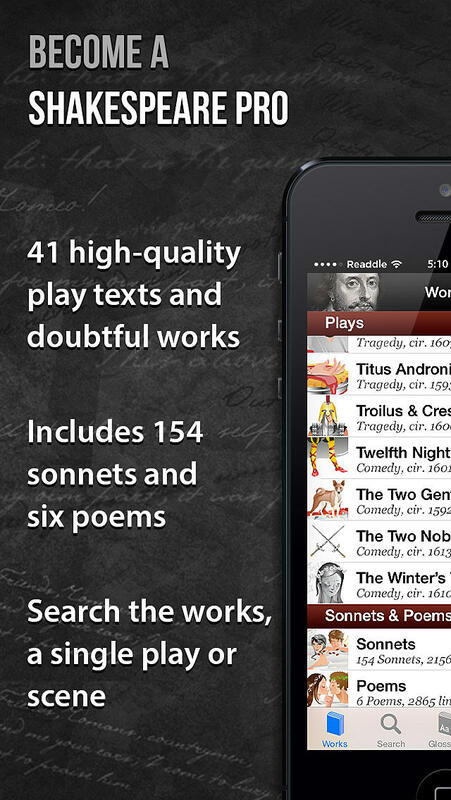 TALES FROM SHAKESPEARE, a series of 20 short versions of Shakespeare’s plays aimed at a younger audience, are included for free. SWITCH ON AUTO-SCROLL to automatically scroll the text as you read and control the speed by tilting your device‚ or even turn your device into a mini-teleprompter.